More often than not, when you hear an astrophysicist talking about a galactic rotation curve, you can expect their next sentence to be somehow related to dark matter. Indeed, one of the main reasons to believe that dark matter exists in the first place is the ubiquity of flat rotation curves in observations of galaxies. But today’s article focuses on a couple of galaxies with rotation curves that have an additional quirky feature – a large “counter-rotating” group of stars that seem to be moving in the opposite direction as the rest of the galaxy. Drawing a rotation curve for a disky galaxy (i.e., spiral or lenticular galaxies) is a relatively straightforward exercise – simply measure the velocities of a bunch of stars, dust, or basically anything you can see that is gravitationally bound by the galaxy, and then plot each velocity as a function of the object’s radial distance from the center of the host galaxy. For most galaxies, you are likely to obtain a figure like the one shown on the left side of Figure 1. For a small subset of disky galaxies, however, the behavior is much more peculiar. In addition to the typical rotation of most of the stars in a given direction, a small portion of the disk appears to rotate the other way – a so-called “counter-rotating” disk, as shown on the right hand side of Figure 1. Counter-rotating disks typically exist in a galaxy that is in the process of evolving or that has undergone some type of merger or accretion event. However, the specific mechanism that causes them still remains unclear in many cases. Figure 1. Two galactic rotation curves. Left: a typical rotation curve with a flat continuum out to over 30 kpc, taken from NGC 3198 (source: Begeman 1989). Right: the rotation curve from NGC 4550, a galaxy that hosts a well-studied counter-rotating element: the red points mark the primary disk, while the blue points mark the counter rotating disk. A counter-rotating gas component is also shown (source: Johnston et al. 2013). Ever since counter-rotating disks were first observed in the late 1980s, astronomers have proposed many explanations for their specific origins. These include the gradual accretion of gas flowing in the opposite direction as the original disk, a minor merger with a small, gas-rich galaxy, or even an elegant theoretical dynamics argument called “Separatrix Crossing.” Understanding exactly what causes a subset of stars in a certain galaxy to “go against the flow” can help shed light on how that specific galaxy came to be and more generally on how galaxies form and evolve. Today’s paper examines two galaxies, NGC 448 and NGC 4365, that exhibit counter-rotating elements in their central region. 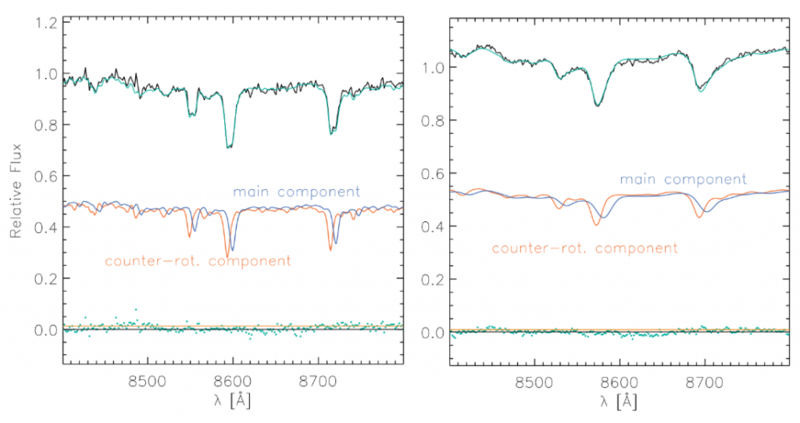 The authors call these regions “kinematically distinct cores,” or KDCs. They study the kinematic characteristics of the two KDCs as well as the properties of the stellar populations that make up each of the KDCs. They then compare their findings to the general population of stars in each galaxy in an attempt to learn something about the unique origin or formation mechanism of each KDC. In the case of NGC 448, the authors find a clear difference between the velocity spread of the counter-rotating component and that of the general stellar population. They demonstrate that the observed spectrum of the galaxy can be fit very well using two components that have an absolute velocity difference of over 200 km/s (see left hand panel of Figure 2). The ages of the stars in the KDC are similar to the ages of stars in the rest of the galaxy, but their chemical composition is distinct, exhibiting higher metallicities than the rest of the galaxy. This suggests that the KDC was formed through an external mechanism – either by the accretion of gas against the direction of the galaxy’s rotation and the subsequent formation of stars from that gas, or by the direct accretion of stars from a nearby galaxy. Unlike in NGC 448, the difference between the velocity spread of the KDC in NGC 4365 and that of the general stellar population is less pronounced (see right hand panel of Figure 2). Though many stars in the core of NGC 4365 rotate in a different direction than the rest of the galaxy, the authors claim that the lack of a clear-cut kinematic decoupling between two distinct stellar elements points to a projection effect of orbits in a triaxial potential (that is, a potential that is neither spherical, nor prolate, nor oblate, but rather has different scale lengths on all three axes). A potential like this likely hosts orbits that rotate in random directions. This is unlike what we typically see in a disky galaxy, in which most stars rotate in the same direction and are confined to a plane. But projecting these orbits to 2D (which cannot be avoided for observations of any galaxy that isn’t the Milky Way) will artificially separate out a component of counter-rotating orbits, even though in 3D all of the orbits are more uniformly oriented. Figure 2. Left: two-component fit to the spectrum of NGC 448. The top line shows the actual spectrum, with the green superposed line showing the two-component fit (the fit is nearly indistinguishable from the data in this plot). The blue and the red lines below show the contribution from each of the fitted components, and the green points at the bottom quantify the residual from the fit. According to this plot, the main component is moving away from us, causing a slight redshift to the spectrum, while the counter-rotating component is moving toward us, slightly blue-shifting the spectrum with respect to the main component. Right: same as the left plot but for the spectrum of NGC 4365. Note how in this case the main component is more spread out, and overlaps quite significantly with the counter-rotating component (Figures 4 and 9 in the paper, respectively). As scientists, we strive to explain our observations with one simple, all-encompassing theory. In this case a naive assumption might have been that all KDCs originate from a similar mechanism. But sometimes, and especially when dealing with phenomena as complicated as galaxy formation and evolution, we must accept that one unified theory is not always enough. Today’s paper is a great example of such a case. By investigating two similar examples of counter-rotating stellar components, the authors show that a variety of galaxy formation scenarios are not only possible — they are necessary. I am a second year graduate student at Columbia University, where I currently focus on galactic dynamics, resonances and chaos, galaxy simulations, and the nature of Dark Matter. I grew up in Israel, received my bachelor’s degree from Princeton University, and spent three years solving earthly problems as a business management consultant, before deciding to return to stargazing. When I’m not busy thinking about colliding galaxies and writing horoscopes, you can usually find me either cooking, eating, or exploring new running routes through the concrete jungle that is NYC.